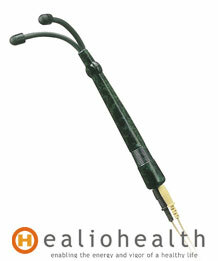 Facial Massager Two-Headed Conductive Acu-point Probe, Micro Beauty GC MC II is lghtweight and easy handy. The distance of the two heads of facial massager acu-point Probe is just made to treat your face, especially for the portion of the eye tail, the bridge of the nose, the cheekbone, etc. It is able to open the two conductive heads to 10 cm wide in maximum.